Kveta Peschke and Katarina Srebotnik each won their maiden Grand Slam ladies doubles title by beating Sabine Lisicki and Samantha Stosur in the final. The second seeds won 6-3 6-1 in an hour and 11 minutes. 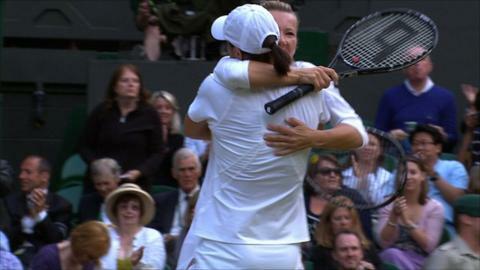 The teams exchanged a break each in the first six games but a break against Lisicki in game eight was decisive. Peschke and Srebotnik reeled off nine games in a row, as Lisicki's serving continued to go awry, before wrapping up their historic victory. Srebotnik had previously won five Grand Slam mixed doubles titles. Peschke's title completed a memorable double for Czech tennis following Petra Kvitova's singles title earlier in the day. The pair are also set to go to the top of the world rankings and Srebotnik said: "To be number one is a dream of every player, whether in singles or doubles and we're very proud of that. "Through the whole tournament we played extremely well. Today we kept our nerves. Even though we were down 1-3 in the first set we believed and knew we could win it. "Winning a Grand Slam here at Wimbledon is for me a special moment. It's impossible to describe and it hasn't sunk in. We've been waiting for this a long, long time. "I've been in four women's doubles finals before. You want to get that Grand Slam under your belt."